Royal Caribbean’s Anthem of the Seas has gotten a lot of attention since she debuted earlier this year and she has arrived in the New York City area this week, where she will find her new home at Cape Liberty. I have the pleasure of taking a quick 2-night cruise aboard Anthem of the Seas this weekend, and on this week’s podcast, we will preview my plans for Anthem of the Seas and discuss what I have planned onboard and discuss why Royal Caribbean’s newest cruise ship is so darn exciting. I also have a very important announcement to make in this episode and we have some great listener feedback to share. 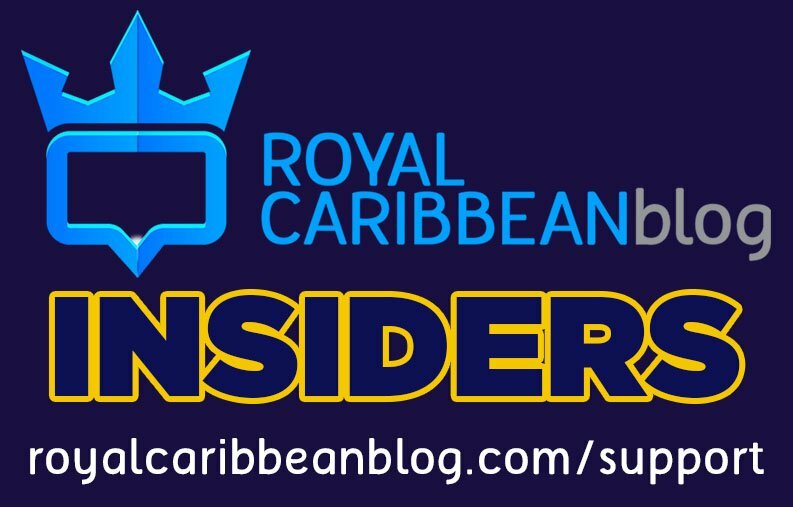 Anthem of the Seas "super live blog"
Join the Royal Caribbean Blog INSIDERS and help support the show! 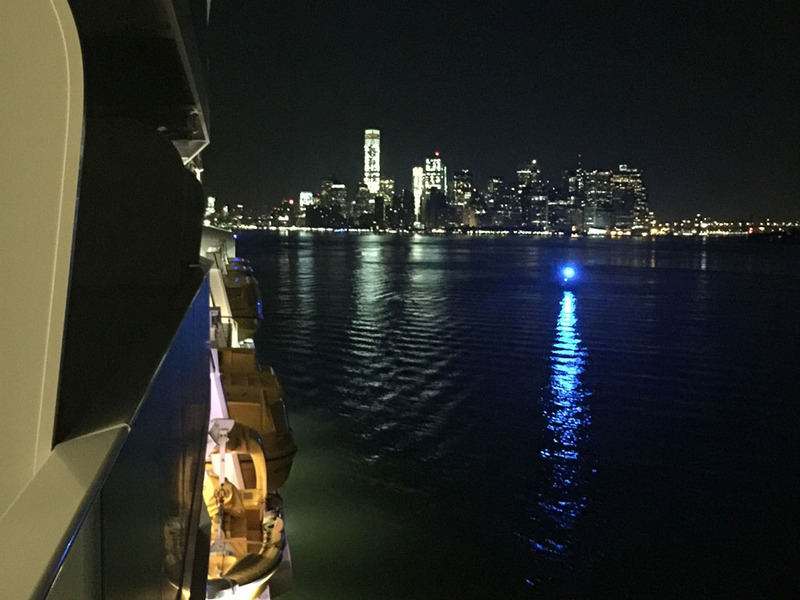 Royal Caribbean's newest Quantum class ship, Anthem of the Seas, arrived in New York Harbor early this morning and we have the first batch of photos from her arrival. During her arrival in the early hours of the morning, Anthem of the Seas passed under the Verazzano bridge and went past the Statue of Liberty before heading into Cape Liberty. Anthem of the Seas will be offering a few short 2-night cruises to members of the media and travel agents and then begin offering regularly scheduled cruises out of Cape Liberty in Bayonne, New Jersey. Royal Caribbean Blog will be providing live coverage of Anthem of the Seas, beginning on November 6th. Royal Caribbean is planning a live video broadcast from Anthem of the Seas on November 13, 2015 via the new social media app, Periscope. Royal Caribbean promised live broadcasts on Periscope when it announced its new "Come Seek" marketing campaign last month. The live broadcasts will be available to watch from any smart phone or tablet that has Periscope installed on it. Royal Caribbean will also simulcast the Periscope sessions at 230 geo-targeted units across New York City in high traffic commuter areas, such as John F. Kennedy International Airport terminal, newsstands and subways. Using the Voom high speed internet, these live tune-ins from the ships to show off the experience as it's happening in real time. Royal Caribbean previously indicated that these broadcasts will be shown around "peak commuting times". These live look-ins via Periscope will occur throughout the month of November following the November 13th premiere. Will you be watching Royal Caribbean's live Periscope broadcasts? Tell us in the comments! Just how impressive is Royal Caribbean's latest Quantum class cruise ship, Anthem of the Seas? There's a new visual means of understanding how big she is with this new infographic! 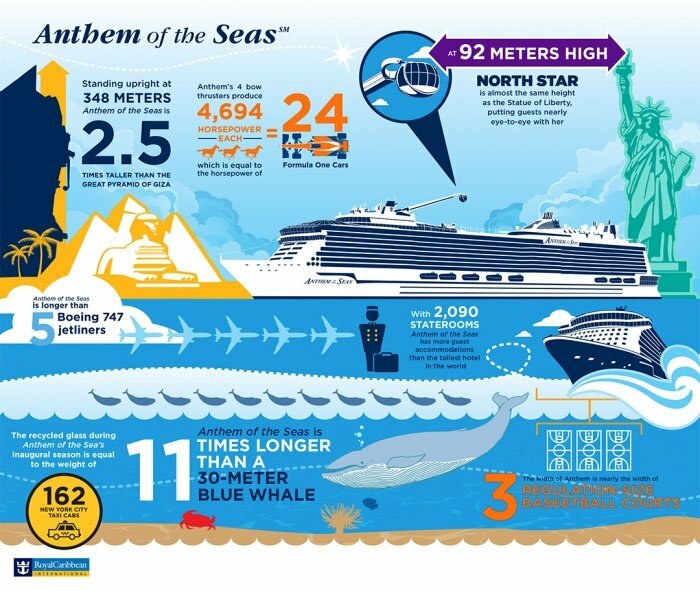 In anticipation of Anthem of the Seas' arrival in the New York City area this week, Royal Caribbean compared Anthem of the Seas to some pretty large things, such as the Statue of Liberty, a blue whale and Boeing 747 jetliners. Royal Caribbean's Anthem of the Seas has a lot to offer, including a number of staterooms. Today, we will look at the Royal Family Suite stateroom and take you through the cabin to give you an idea of what to expect if you book this type of stateroom. On Anthem of the Seas, Dale Hicks shared photos of stateroom 10634, which is located on Deck 10. Entry to the room is by RFID scanner, which is above the door handle. After immeditately walking in, there is a full sized closet. Opposite the closet is one of the bathrooms. This bathroom is a lot like the bathroom you would find in many staterooms on Anthem of the Seas. The first bedroom is a room with two double beds. The bathroom shown in earlier photos is likely to be used most by these rooms. Here is a good look at the living room area of the suite. The Royal Family Suite offers 543 square feet of living space. Let's head into the master bedroom. The master bedroom includes a king size bed and television. Next up is the master bathroom. The master bathroom features a full size tub and more space than the other bathroom. Of course, the Royal Family Suite features a balcony, and this one is rather large. The balcony size for this stateroom ranges between 166 to 263 sq. ft.
Royal Caribbean's Anthem of the Seas offers so many innovative and fun activites onboard, so naturally many guests onboard are all interested in doing them too. If you want to do all the cool activities onboard, here are some surefire methods to see it all, without waiting for it all. In order to do any of the really fun things onboard Anthem of the Seas, you need to first get onboard, so why waste time waiting in the cruise terminal? Royal Caribbean offers a new program, where you can go "sidewalk to ship" in 10 minutes and if you take advantage of this, you too can get onboard much quicker. What you need to do is fill out all the important legal information at home and even take their own "selfie" photo to be used with their SeaPass card. You will still be able to check-in the "old fashioned way" at the cruise terminal too but those that take advantage of the new system will get onboard a whole lot quicker. Anthem of the Seas' North Star observation pod is arguably the most impressive, and popular, activity on the ship. Who does not enjoy sweeping views of everything around you from a height of 300 feet? If you want to check out North Star, or even experience it more than just once, there are ways to beat the long lines that tend to be there. The best time to experience North Star is when you are in a port, because most guests are off the ship exploring the port of call. This means, there are far less guests to compete with for a line. In addition, try for hopping in line bright and early in the morning. If you can wrangle yourself out of bed and get in line 10 minutes or more before North Star opens, you will likely find yourself on the first ride of the day. Lines quickly develop shortly thereafter. Interestingly, you can also find luck with less lines during dinner hours. As more and more guests leave the pool area and head somewhere to eat, there is less competition for North Star rides. Those last few rides of the evening can often have little to no wait. One feature on Anthem of the Seas that always captures the attention of guests is Ripcord by iFly. This skydiving simulator sounds, looks and feels really, really cool, and many guests want to give it a try. If you want to experience Ripcord, your best bet is to reserve a spot online before your cruise. Using Royal Caribbean's Cruise Planner, you can reserve a time to ride for you and others in your group. And there is no additional cost! By reserving in advance, you will avoid the line of guests who are trying to figure out when they can be squeezed in for a ride. It might seem like the bumper cars and FlowRider surf simulator have very little in common, but if you want to experience either, the secret is the same: go on embarkation day. Usually these activities are up and running as you board the ship, but most guests are not thinking about them yet. Given that Anthem of the Seas is based out of Bayonne, New Jersey, a ride on the FlowRider during the cooler months of the year may not sound like a great idea but if you want a chance to ride the FlowRider over and over and over again, head there on embarkation day. Likewise, bumper cars on embarkation day will find the shortest lines. It is your best bet for slamming into other guests without a really long wait. There are a lot of restaurants onboard Anthem of the Seas, and if you are on Dynamic Dining Choice, you will have the opportunity to eat at any of them, when it is convenient to you. But you ought to plan ahead where and when you will be eating to avoid possible waits. Royal Caribbean has done a lot to engineer the Dynamic Dining experience so that wait time to be seated is mitigated, but we suggest you make reservations in advance to assure yourself of the shortest waits. Guests can book reservations for any of the complimentary or specialty restaurants online via the Cruise Planner. The Cruise Planner is simple and you can always change the times you book, so you do not have to worry about being "locked into" anything you select. In our experience, having reservations always beats trying to show up without one. Something sure to catch anyone's attention as they walk by, is the Bionic Bar, where robots make cocktails for guests on demand. Because it draws the eye so easily, crowds often form around the Bionic Bar because everyone wants to see the robots in action (and probably take a selfie with them). If you want to find the lowest crowds at the Bionic Bar, try for the late afternoon. There is a noticable slowdown after 3pm, when many guests are all over the ship doing other things and the Bionic Bar is not nearly as busy. And it's more likely you actually want a drink at this time, rather than morning hours, which are also fairly uncrowded. The Bionic Bar picks back up in the evening, when you will find a DJ usually playing music nearby, so take advantage of the Bionic Bar right before it's 5 o'clock somewhere. 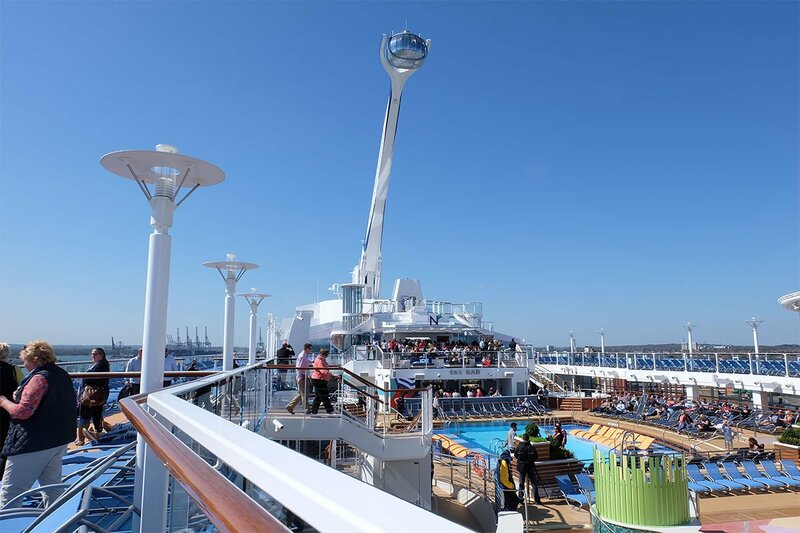 Royal Caribbean has been adding digital wayfinders to their cruise ships since they were first introduced on Oasis of the Seas, but recently, they have gotten a software upgrade that gives them much more functionality. Royal Caribbean's digital wayfinders are interactive kiosks found in the elevator lobbies of most ships. It offers guests access to what is happening on the ship, directions to anywhere on the ship and even restaurant information. Recently, Royal Caribbean upgraded the software for these wayfinders to allow guests to locate any ship in Royal Caribbean's fleet, read more information about the officers and more. When using the wayfinders, guests can choose from a variety of options. The "Ship Locator" is one of the new links, that will give guests a look at the location of every ship in the fleet. In fact, the Ship Locator will also show the location of sister company ships, such as Celebrity Cruise and Azamara Club Cruise ships. Guests can also look up information on the officers onboard their Royal Caribbean ship and learn more about each one of them. Big thanks to Royal Caribbean Blog reader Rich Freudenberg for providing these photos! These new features were first introduced on Quantum of the Seas, and will also be available on Harmony of the Seas and Ovations of the Seas. Royal Caribbean kicked off today a special 72-hour sale on Anthem of the Seas cruises, where staterooms begin at just $699 per person and guests can get $100 to spend onboard when booking a balcony or suite. Guests that book a balcony or suite stateroom on Anthem of the Seas for sailings that depart between January 1 and March 31, 2016 will qualify for a $100 bonus onboard credit. 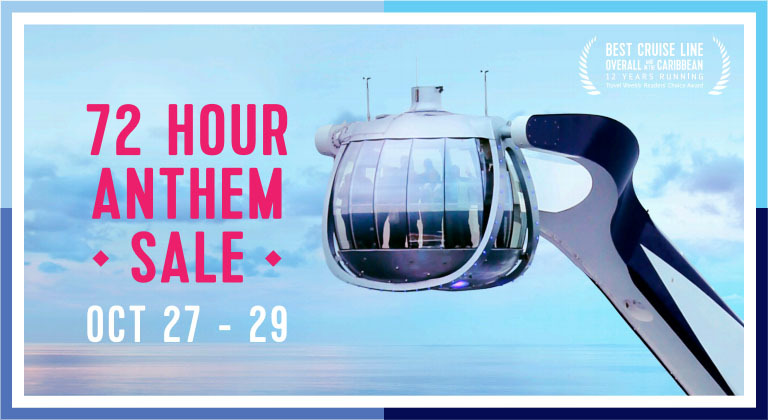 This 72-hour Anthem of the Seas sale runs between October 27 and 29, 2015. This offer is combinable with restricted rates (for example, Seniors, Residents, Military, 30% Savings) as well as NextCruise offers. OBC offer is not combinable with Crown & Anchor discounts and Shareholder Benefits. Offer open to residents of the United States or Canada. Royal Caribbean will once again have a float in the Macy's Thanksgiving Day Parade this year, likely to promote the arrival of Anthem of the Seas to her new homeport of the New York City area. 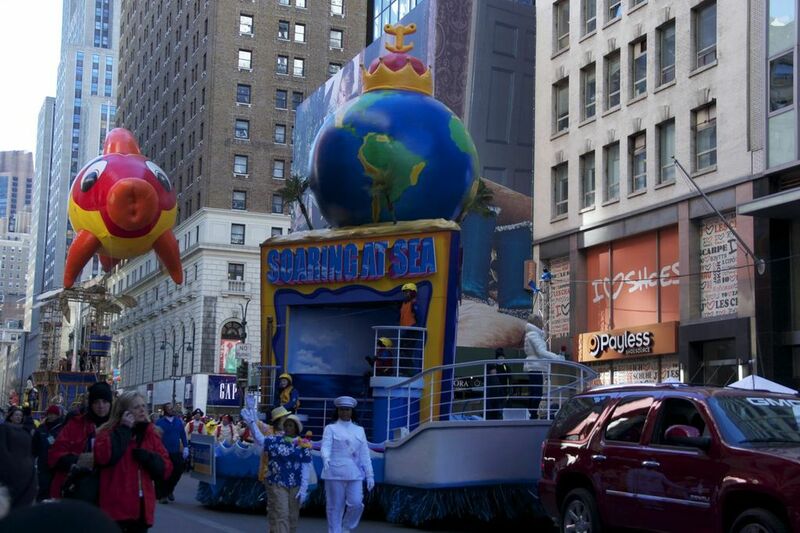 Macy's Thanksgiving Parade website has Royal Caribbean's float listed and a photo of the float that Royal Caribbean has used for the last two years, entitled, "A World At Sea". The float was designed by the creative artists of the Macy’s Parade Studio and depicts three distinct postcard scenes which take place onboard a Royal Caribbean ship. The rotating scenes depict three “WOW” moments found only on Royal Caribbean, including the FlowRider surf simulator, thrilling zip line and iconic rock climbing wall. Royal Caribbean has had a parade float in the annual event the last two years to promote sister ship, Quantum of the Seas. The 89th annual Macy's Thanksgiving Day Parade airs nationwide on NBC, on Thursday, Nov. 26, 2014. Thanks to Cruise Ship News for the find! Royal Caribbean's Anthem of the Seas is wrapping up her European cruise season in preperation for her move across, "the pond" to the United States, where she will arrive at her new home in the New York City area. Royal Caribbean Blog reader Steven van Belleghem sent us these great shots of Anthem of the Seas today in Zeebrugge, Belgium.